A new broad mineralized zone, "BMZ3", has been confirmed by drilling in the Yaraguá system. BMZ3, which is located approximately 150 metres west of BMZ1, is hosted within a breccia matrix, thus differentiating it geologically from BMZ1 and BMZ2. Drilling results into BMZ3 announced herein cover an area measuring approximately 110 metres laterally by 175 metres vertically. The zone remains wide open vertically in both directions and drilling is underway to test the extent of the mineralization. TORONTO , Feb. 21, 2019 /CNW/ - Continental Gold Inc. (TSX:CNL; OTCQX:CGOOF) ("Continental" or the "Company") is pleased to announce additional high-grade assay results from six holes drilled into the Yaraguá vein system as part of the exploration drilling program at its 100%-owned Buriticá project in Antioquia, Colombia . The Company is currently operating six underground definition drill rigs and one exploration drilling rig. As previously announced, the Company plans to drill up to 73,500 metres in 2019, consisting of approximately 55,000 metres of capitalized definition drilling and approximately 18,500 metres of exploration-led infill drilling. Supporting information for results discussed in this release can be found in Table 1 and Figures 1 and 2. 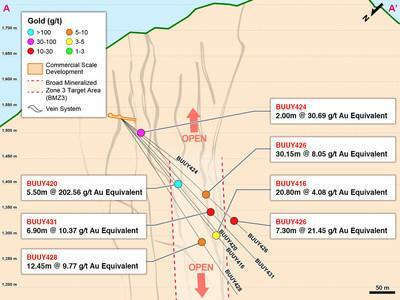 "The discovery of BMZ3 is an important milestone for the Buriticá Project as it delivers another potential bulk mineable zone to our mine-planning group ahead of anticipated first gold pour in H1 2020," said Ari Sussman , CEO. "With the construction of the Buriticá mine continuing on schedule at a brisk pace, excitement and momentum are growing rapidly with our employees and the Buriticá community." Drilling results announced in this release have intercepted high-grade gold over significant dimensions measuring approximately 300 metres laterally by 300 metres vertically. The Company also anticipates receiving additional assay results shortly for recently completed drill-holes into the BMZ2 discovery announced on January 15, 2019 . Results will be reported once they are compiled and interpreted. Intercepts calculated for minimum intervals of 0.5 metres. Grades herein are reported as uncapped values. Gold equivalent in this release and table was calculated at Au:Ag ratio of 1:75 with no assumptions made for metallurgical recovery rates. Continental's 100%-owned, 75,023-hectare project, Buriticá, contains several known areas of high-grade gold and silver mineralization, of base metal carbonate-style ("Stage I") variably overprinted by texturally and chemically distinctive high-grade ("Stage II") mineralization. The two most extensively explored of these areas (the Yaraguá and Veta Sur systems) are central to this land package. The Yaraguá system has been drill-outlined along 1,350 metres of strike and 1,800 vertical metres and partially sampled in underground developments. The Veta Sur system has been drill-outlined along 1,300+ metres of strike and 1,800 vertical metres and has been partially sampled in underground developments. Both systems are characterized by multiple, steeply-dipping veins and broader, more disseminated mineralization and both remain open at depth and along strike, at high grades. BMZ3 consists of a group of modelled precious metal-bearing vein domains that interlope within an intrusive breccia with pervasive hydrothermal alteration (quartz, sericite and pyrite), resulting in a fracturally controlled zone of mineralization. As a result, bulk mineralization is pervasive in this zone albeit at somewhat lower grades than the individual modeled veins presenting potential for more productive mineable zones. To date, the Company has identified up to seven BMZ targets for testing and will systematically drill each target zone as underground mine development advances. Mauricio Castañeda, Vice-President, Exploration of the Company and a Qualified Person for the purpose of Canadian National Instrument 43‑101 ("NI 43‑101"), has prepared or supervised the preparation of, or approved, as applicable, the technical information contained in this press release. Reported intervals include minimum weighted averages of 3 g/t gold equivalent (1:75 Au/Ag) over core lengths of at least 1.0 metres. Assays are uncut except where indicated. Besides rigorous chain-of-custody procedures, the Company utilized a comprehensive quality control/quality assurance program for the channel samples. All quality control anomalies were addressed and/or corrected as necessary to assure reliable assay results; no material quality control issues were encountered in the course of the program. Crush rejects and pulps are kept and stored in a secured storage facility for future assay verification. Although historic correlation between analytical results from the Company's internal laboratory and certified independent laboratories for gold and silver analysis have been within acceptable limits, the Company's internal laboratory is neither independent nor certified under NI 43-101 guidelines and, as such, channel sampling results in this release should only be taken by the reader as indicative of future potential. For exploration and infill core drilling, the Company applied its standard protocols for sampling and assay. HQ and NQ core is sawn or split with one-half shipped to a sample preparation laboratory in Medellín run by ALS Colombia Limited ("ALS"), whereas BQ core samples are full core. Samples are then shipped for analysis to an ALS-certified assay laboratory in Lima, Peru . The remainder of the core is stored in a secured storage facility for future assay verification. Blanks, duplicates and certified reference standards are inserted into the sample stream to monitor laboratory performance and a portion of the samples are periodically check-assayed at SGS Colombia S.A., a certified assay laboratory in Medellín, Colombia. The Company does not necessarily receive assay results for drill holes in sequential order; however, all significant assay results are publicly reported. For information on the Buriticá project, please refer to the technical report, prepared in accordance with NI 43‑101, entitled "Buriticá Project NI 43–101 Technical Report Feasibility Study, Antioquia, Colombia " and dated March 29, 2016 with an effective date of February 24, 2016 , led by independent consultants JDS Energy & Mining Inc. Additional information on the Company's updated mineral resource estimate for the Buriticá project, with an effective date of January 26, 2019 and prepared by the Company under the guidance and supervision of Mr. Ivor W.O. Jones , M.Sc., FAusIMM, CPgeo, P.Geo (an independent Qualified person under NI 43-101 guidelines), is available in the Company release dated January 30, 2019 . The technical report and Company release are available on SEDAR at www.sedar.com, on the OTCQX at www.otcmarkets.com and on the Company website at www.continentalgold.com. Continental Gold is the leading large-scale gold mining company in Colombia and is presently developing it's 100% owned Buriticá project in Antioquia. Buriticá is one of the largest and highest-grade gold projects in the world and is being advanced utilizing best practices for mine construction, environmental care and community inclusion. Led by an international management team with a successful record of discovering, financing and developing large high-grade gold deposits in Latin America, the Buriticá project is on schedule with first gold pour anticipated during the first half of 2020. Additional details on Continental Gold's suite of gold exploration properties are also available at www.continentalgold.com. This press release contains or refers to forward-looking information under Canadian securities legislation—including statements regarding: timing of drill results and first gold pour; advancing the Buriticá project; exploration results; potential mineralization; potential development of mine openings; potential improvement of mining dilution grades; reducing start-up risks; and exploration and mine development plans—and is based on current expectations that involve a number of significant business risks and uncertainties. Forward-looking statements are subject to other factors that could cause actual results to differ materially from expected results. Readers should not place undue reliance on forward-looking statements. Factors that could cause actual results to differ materially from any forward-looking statement include, but are not limited to, an inability to advance the Buriticá project to the next level, failure to convert estimated mineral resources to reserves, capital and operating costs varying significantly from estimates, the preliminary nature of metallurgical test results, delays in obtaining or failures to obtain required governmental, environmental or other project approvals, political risks, uncertainties relating to the availability and costs of financing needed in the future, changes in equity markets, inflation, changes in exchange rates, fluctuations in commodity prices, delays in the development of projects and the other risks involved in the mineral exploration and development industry. Specific reference is made to the most recent Annual Information Form on file with Canadian provincial securities regulatory authorities for a discussion of some of the factors underlying forward-looking statements. All the forward-looking statements made in this press release are qualified by these cautionary statements and are made as of the date hereof. The Company assumes no responsibility to update them or revise them to reflect new events or circumstances other than as required by law. This press release was prepared in accordance with Canadian standards, which differ in some respects from United States standards. In particular, and without limiting the generality of the foregoing, the terms "inferred mineral resources," "indicated mineral resources," "measured mineral resources" and "mineral resources" that may be used or referenced in this press release are Canadian mining terms as defined in accordance with National Instrument 43‑101 – Standards of Disclosure for Mineral Projects under the guidelines set out in the Canadian Institute of Mining, Metallurgy and Petroleum (the "CIM") Standards on Mineral Resources and Mineral Reserves (the "CIM Standards"). The CIM Standards differ significantly from standards in the United States . While the terms "mineral resource," "measured mineral resources," "indicated mineral resources," and "inferred mineral resources" are recognized and required by Canadian regulations, they are not defined terms under standards in the United States . "Inferred mineral resources" have a great amount of uncertainty as to their existence, and great uncertainty as to their economic and legal feasibility. It cannot be assumed that all or any part of an inferred mineral resource will ever be upgraded to a higher category. Under Canadian securities laws, estimates of inferred mineral resources may not form the basis of feasibility or other economic studies. Readers are cautioned not to assume that all or any part of measured or indicated mineral resources will ever be converted into reserves. Readers are also cautioned not to assume that all or any part of an inferred mineral resource exists or is economically or legally mineable. Disclosure of "contained ounces" in a resource is permitted disclosure under Canadian regulations; however, United States companies are only permitted to report mineralization that does not constitute "reserves" by standards in the United States as in place tonnage and grade without reference to unit measures. Accordingly, information regarding resources contained or referenced in this press release containing descriptions of our mineral deposits may not be comparable to similar information made public by United States companies.